From one of the most promising economies in sub-Saharan Africa to a nation struggling amid a crippling debt crisis, Mozambique’s fall from grace has been swift and replete with shady dealings. 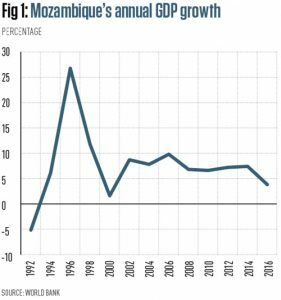 In 2014, the capital, Maputo, was chosen by the International Monetary Fund (IMF) to host its Africa Rising conference in recognition of Mozambique’s economic growth – an enviable 7.4 percent per year across two decades (see Fig 1). At the time, the IMF’s managing director, Christine Lagarde, spoke of the country’s “impressive performance” and her “high hopes” for the future. But in the four years since, much of that optimism has dissipated. In 2016, the discovery of undisclosed government loans worth up to $2bn precipitated an abrupt end to Mozambique’s economic success story. IMF aid was withdrawn and debt payments have subsequently been missed. In March of this year, finance minister Adriano Maleiane explained that creditors might have to wait another decade before they are repaid. As the scandal deepens, questions are rightly being raised about the role played by international agencies, developed countries and global banks – specifically, how much responsibility they should take for the economic upheaval that will ultimately see the Mozambican people suffer. While government officials must surely be held accountable for their actions, so too must many others for a crisis in which few people’s hands are clean. No story of Mozambique’s current debt crisis would be complete without examining the country’s more prosperous past. Following the end of the civil war in 1992, the national government implemented a series of macroeconomic reforms that looked to make the most of the country’s natural resources and facilitate a transition towards a market economy. Post-war megaprojects like the Mozal aluminium smelter helped curb Mozambique’s overreliance on the agricultural sector, which saw its share of GDP fall from 38 percent in 1992 to 20 percent by 2001. Efforts to boost human development in the country, particularly in rural areas, started to pay off, with the proportion of citizens living in poverty falling from 69 percent in 1996 to 54 percent in 2003. The government’s fiscal policies, many of which were supported by the IMF, lowered trade barriers and simplified the tax system. Life for many in Mozambique may not have been comfortable – the country’s per capita income was still 40 percent below the average for sub-Saharan Africa in 2012 – but there were reasons for optimism, at least. 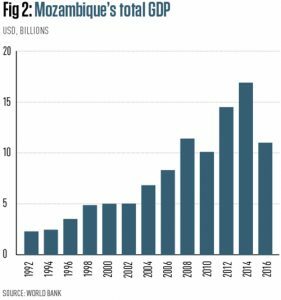 But as Mozambique was cashing in on these plaudits and receiving numerous investment proposals in the early 2010s, problems started to appear below the surface. Falling commodity prices, clashes between rival parties and environmental challenges began threatening the economic and political stability that the country had enjoyed for the previous two decades. Worse was still to come. Back in 2013, the Mozambique Government borrowed $2bn in order to set up three state-backed tuna fishing companies, with the loans arranged by Credit Suisse and a Russian investment bank. Although there is nothing particularly unusual about a developing nation asking for outside help to fund its economic projects, in this case the request was kept hidden, with the loans agreed in secret away from the scrutinising eyes of the country’s parliament. The secrecy initially disguised the fact that the numbers involved in the deal simply didn’t add up. Firstly, $2bn is a colossal amount for a country of Mozambique’s financial heft, representing more than 12 percent of the country’s GDP (see Fig 2). And second, the loans were taken out on the wildly optimistic assumption that the new tuna fleet would be able to catch $200m worth of fish every year. Even if such ambitious goals were achieved, they would still fail to match the annual repayments (including interest) of $260m. The irregularities surrounding the loan perhaps help explain why it was not originally made public – its full extent only became known in early 2016. The subsequent breakdown in trust between Mozambique and its creditors caused international donors, the IMF and the World Bank to suspend all financial aid. While the initial disclosure damaged Mozambique’s financial credibility, subsequent revelations have served to exacerbate the crisis. An independent audit report by risk consultancy firm Kroll found that Mozambique’s state-owned tuna businesses paid $713m more for maritime equipment than it was worth. What’s more, a significant proportion of the funds were not spent on new fishing boats at all. Among other naval supplies, three Ocean Eagle 43 military vessels were purchased, each capable of launching unmanned aerial vehicles and dispensing machine gun fire. These could help Mozambique police its waters, but they won’t directly contribute to its lofty fishing goals. The audit also found that $500m of the loan simply remains unaccounted for, all of which adds up to a murky deal that is proving difficult to illuminate. 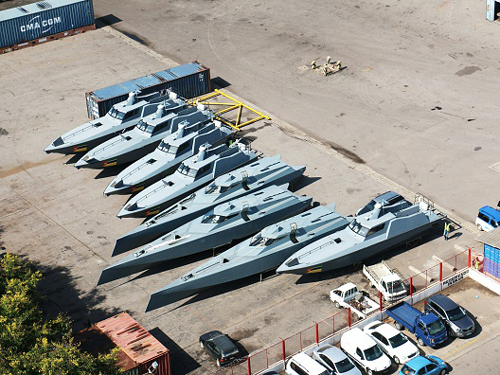 The three Mozambican companies that received the $2bn loan – Ematum, ProIndicus and Mozambique Asset Management (MAM) – have yet to begin meaningful operations, with many of their boats sitting unused in the Maputo harbour. Antonio do Rosario, the chairman of all three organisations, has so far resisted the efforts of investigators by withholding data on “national security” grounds. Clearly, the close connections between politics and business in the country make accountability a challenge. Armando Guebuza, president in 2013, justified his decision to offer government guarantees on the loans in patriotic terms. The current president, Felipe Nyusi, who was minister of defence at the time the loans were issued, was a trustee at Ematum, while Rosario himself holds a prominent position within the state intelligence and security service. Although accountability for the debt scandal is proving difficult, this has not lessened its impact. Foreign grants fell to less than $200m following the discovery of the hidden loans in 2016, down from $700m in 2014. During the same period, foreign direct investment plummeted by 40 percent. Last year, economic growth slowed to just 3.7 percent, and today the country’s financial credibility languishes at the lowest levels among the majority of credit rating agencies. So in order to regain the respect of its creditors and restart the aid programmes upon which it relies so heavily, Mozambique has been given little choice but to impose austerity on its already impoverished citizens. On the surface, it is easy to dismiss Mozambique’s ongoing debt crisis as another example of a sub-Saharan African nation undone by corrupt politicians misusing foreign aid. A closer look, however, reveals that to lay all of the blame for this particular debacle at the feet of government elites would be to let other unscrupulous parties off the hook. In particular, one has to look at the role played by both of Mozambique’s creditors in encouraging the country to take out a loan when it was highly unlikely it would ever be able to pay it back. When attempting to justify its actions, Credit Suisse pointed to its own feasibility studies, which indicated that Mozambique would be able to sell its tuna for three times as much as the Seychelles. Given that this is exactly the same fish – the maritime boundaries of Seychelles and Mozambique are separated by just a few hundred miles at their nearest point – such claims were optimistic at best and wilfully misleading at worst. In many parts of the world, if an individual walks into a bank and requests a business loan despite lacking a sound business proposal, the lending institution would be deemed guilty of reckless lending and find itself at least partially liable for the debt once the customer inevitably defaults. In international law, this is not the case. Hanlon believes that this lack of regulatory standards has allowed global banks to take advantage of developing countries. If Mozambique’s creditors have taken on the role of modern-day loan salesmen, then they have certainly exacted a high price. Both banks earned almost $200m in fees for arranging the loans, and Credit Suisse even pocketed an additional $4.1m in 2016 for helping to restructure the part of the debt relating to Ematum. Although Credit Suisse has recently responded to the scandal, explaining that it is “cooperating fully with ongoing investigations into the Mozambique financings”, this makes the economic punishment being handed out to Mozambique seem extremely unfair, as does the fact that the tuna fishing loans were never legitimate in the first place: the loans were never approved by the country’s parliament, and the government guarantees subsequently applied to them were in violation of the 2013 and 2014 Finance Acts. Of course, fairness works both ways and, despite the dubious legality of Mozambique’s debt, bondholders will still claim that their investments should be repaid. In-fighting has already begun over this issue, with some Ematum bondholders arguing that they should be paid in full while holders of the ProIndicus and MAM debts should receive nothing. Between all the arguing and the finger pointing, a consensus desperately needs to be reached soon. The people of Mozambique – the only truly innocent party in this ongoing saga – cannot wait any longer for their economy to get back on track. In 2010, as Mozambique was experiencing sustained and rapid economic growth, the country received another boost with the discovery of five trillion cubic metres of natural gas in the Rovuma basin, located just off the country’s coast. If the revelation initially gave hope that Mozambique could continue its upward trajectory, this was swiftly quashed by the hidden debt scandal. Still, it was believed that revenues generated through liquefied natural gas (LNG) production could at least help pay off the country’s debts to the IMF and other creditors. These hopes were dashed completely in March this year, when Maleiane revealed that the country was unlikely to receive its LNG windfall until the late 2020s, owing to delays stemming from political and, somewhat ironically, economic instability. Like many other nations blessed with bountiful supplies of lucrative natural resources, Mozambique has struggled to support other industries while pursuing its offshore riches. Mozambique’s efforts to diversify have not received much external help either. Hanlon laments the fact that the country has been forced into a trap by international financial institutions that have only been willing to support the mineral and energy industries. Unfortunately, the energy industry creates few jobs and centres on long-term projects that do little to alleviate present-day struggles. Donors like the IMF and the World Bank must also carry some of the blame for Mozambique’s inability to develop its other industries. In the name of neoliberal economics, these major aid suppliers pushed the government to significantly reduce state expenditure in exchange for funding. In the 1980s and 1990s, huge pressure was put on Mozambique to rapidly privatise, with the World Bank even supplying loans to privatised businesses when there was little prospect of them being repaid. Changing Mozambique’s economic structure was seemingly more important than sound economic principles. Writing for Third World Quarterly, Hanlon noted that the World Bank’s actions taught the Mozambicans “the lesson that capitalism is not about profit and production, but about patronage – businesses were privatised and given ‘loans’ that need not be repaid based on who you know and donor whim. And for the new businesses, government and donors were major customers and contracts with both were based on patronage, and often kickbacks”. This lesson not only prevented the government from supporting a diversified economy, it also provided a blueprint for the corruption at the heart of the tuna fishing loans. With substantial revenues from LNG not expected for another 10 years or so, Mozambique will need to find another way out of its current predicament. Given that the tuna fishing loans did not receive government approval, there have been calls for the debt to be written off. This now looks highly unlikely, following parliament’s decision to retrospectively validate the loans in April 2017. The best offer on the table at the time of World Finance going to print proposes delaying repayments until as late as 2034 and asks for forgiveness for half of the $249m Mozambique owes in missed interest payments. Three restructuring proposals have been suggested, none of which have been received particularly warmly by investors. However, creditors may have to get over their disappointment and accept the offer to avoid further government defaults – nobody is likely to be pleased with a 50 percent write-down on their repayments, but it is better than receiving nothing at all. Once the restructuring is finalised, Mozambique may finally be able to rebuild its damaged economy. First, the government should encourage a reform of its banking sector: Mozambique has more banks per person than Africa’s two largest economies (Nigeria and South Africa), and it should encourage smaller players to merge in order to fortify the sector against systemic collapse. Additional policies should then be implemented to help the country escape its reliance on natural resources. 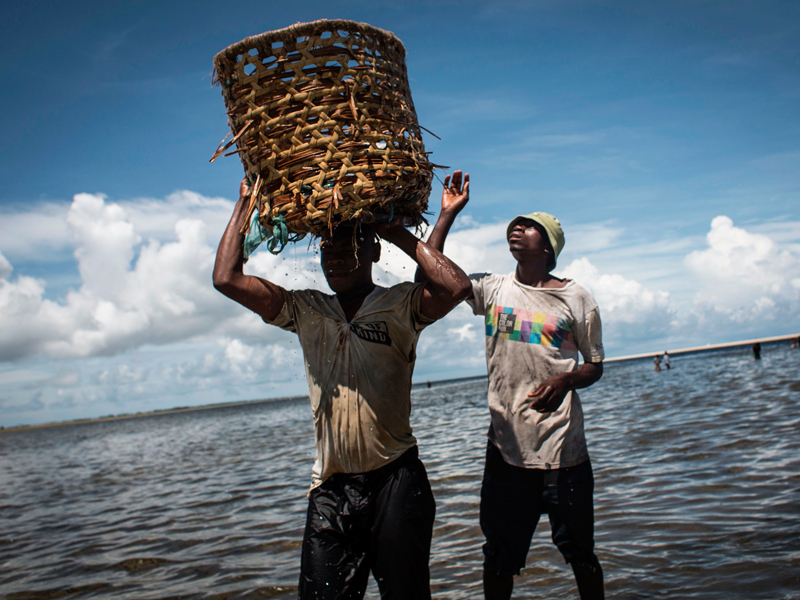 If Mozambique is to reshape its economy, it will first need to be given the freedom to do so. If the IMF is truly committed to sustainable economic growth and reducing poverty, then it cannot impose a crippling programme of austerity on the country. Further investigation into the details of the debt scandal will also improve Mozambique’s financial credibility. In particular, the individuals and businesses responsible must be held to account. The figures involved in the $2bn debt scandal are exorbitant; the price being paid by the Mozambican people is higher still. There is $500m that still remains unaccounted for, $713m that has been diverted through over-invoicing, and some $200m that has gone towards bank commissions. The three state-backed tuna companies that had no plausible business plans at the time the loans were issued remain largely inactive to this day. During the Africa Rising conference in 2014, Christine Lagarde stated: “The IMF has been and will continue to be by [Mozambique’s] side.” The hidden loan scandal that surfaced two years later and the swift withdrawal of financial support showed how little those words truly meant. Undoubtedly, the government officials and private businesses responsible for the illegal debt should be punished, but until vital aid programmes are resumed, it is the ordinary citizens who will continue to suffer.